We have successfully completed our sixth Oyster Pickup at the Chesapeake Bay Oyster Reef Recovery Initiative (ORRI), along with our 6th Annual Oyster Social. Once the oyster growing season concludes in the spring, we gather all of the juvenile oysters that were being fostered by our wonderful oyster growers and plant them on a state-protected oyster sanctuary. Then, everyone gets invited to a huge backyard style BBQ “Oyster Social,” where they get to hear about the statistics for the growing season while they eat oysters and other tasty food. It’s a very fulfilling time of year for us at ORRI to experience the fruits of everyone’s labor. routes, buckets to handle the oysters, and a bagged lunch from Old Mill in Easton. After a brief review of instructions for the day, a good cup of coffee and a doughnut,as well as a huge “thank you,” we sent 26 truck/trailer teams out to retrieve the ORRI oysters. Volunteers chauffeured the juvenile oysters to Easton Point, where they were sent out to be planted in their new home on the Tred Avon sanctuary. Our volunteers went to 302 homes in a period of less than four hours on Friday and safely retrieved 944 cages from Talbot, Dorchester and Queen Anne’s counties. Well done! After successfully getting their bird passenger to safety, the trio attempted to get back to work planting oysters, only to experience engine failure. But thanks to a paper clip, a slim wooden stick, modern-day phone technology and the smarts of Judy, they were back up and running not long after. Spiker mentioned that she was quite impressed with the ability of her boat companions to manually shift the engine and finish the day’s work, despite the setbacks. Less than two weeks later, on Thursday, June 15, over 100 oyster growers and volunteers attended the Oyster Social. An oyster bar, shrimp cocktail, fruit and cheese platters, along with grilled burgers and hot dogs complete with all the fixings, kept everyone satisfied as Judy gave a recap of the growing season. 223,000 oysters in total were planted on the Tred Avon River this year by ORRI! Overall, we have experienced another very successful growing season and celebration at the Oyser Social. We are very grateful for the many kind words we have received from our volunteers and growers commending the organization on how much fun they had helping us out this year, and how well-organized everything was. Now we gear up for oyster deliveries in October, which involves recruiting new growers. We are hosting identical oyster workshops regarding how you can help with oyster restoration efforts from 9 to 10:30 am. 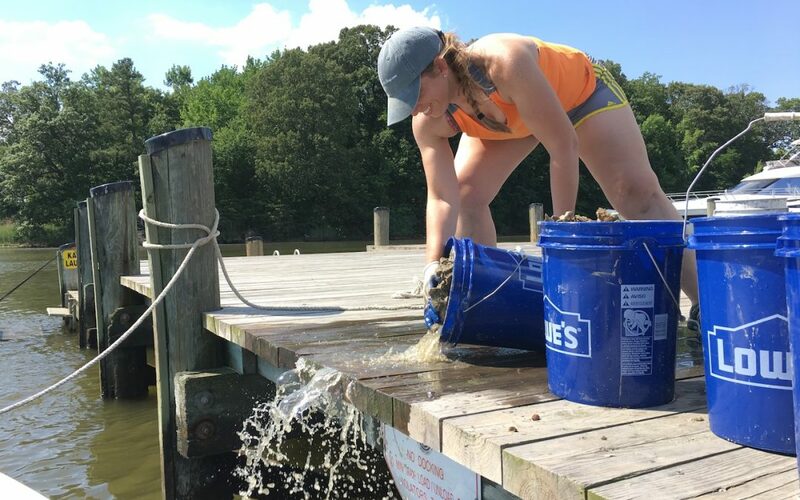 Tuesday, Aug. 1, and Wednesday, Aug. 2, at the Eastern Shore Conservation Center at 114 S. Washington St.
ORRI will be informing people who own or have access to a dock about the details of oyster gardening (which is a free program funded by the state of Maryland). Matt Pluta with the Midshore Riverkeeper Conservancy will be sharing Best Management Practices (BMPs) for homeowners to implement in order to better manage their yards and to take ownership of protecting our waterways. Come learn about potential funding for implementing some of these BMPs at your property. Also speaking on the up-and-coming industry of oyster aquaculture will be Kelley Cox from the Phillips Wharf Environmental Center (PWEC). Here is your opportunity to learn more and ask questions about this oyster industry on the rise. If you are interested in attending the oyster workshop, please call our 24-hour reservation hotline at 410-822-4033 or register online at www.oystersforthbay.com “Contact Us.” Or, if you already know you want to sign up to be an oyster grower or would like to put your name on our list of volunteers, you may also contact us through the above methods. Thank you in advance!